February 27th, 2018 | Lifestyle, Moving For Work, Moving Tips. No matter your motivation—whether you’re moving for work, establishing a home and family, or simply seeking a change of pace—there are many factors to consider as you choose where to settle down. Don’t overlook The Crossroads of America: Indiana! Though it’s often dismissed as a flyover state, Indiana has much to offer, and the town of Bloomington showcases some of the state’s most appealing qualities. 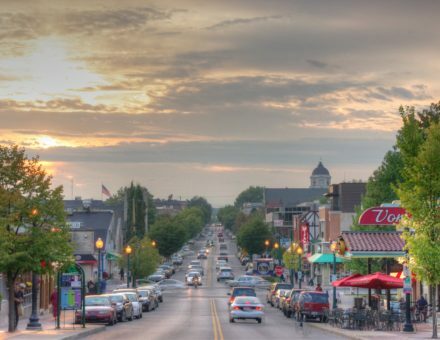 Is Bloomington, Indiana the right town for you? 1. You’re a nature lover. Compared to the northern half of the state, the landscape of southern Indiana is considerably more varied and forested, offering some of the state’s most breathtaking vistas and challenging trails. With 200,000 acres of rolling hills, dense trees, and crystal lakes, Bloomington’s Hoosier National Forest is an ideal destination for camping, hiking, biking, and horseback riding. In the fall, take a drive or hike through nearby Brown County State Park, which is famed for the beauty of its autumn leaves. You’ll also appreciate Bloomington’s various nature preserves and parks. If being out under the open sky and admiring all that the natural world has to offer is your idea of heaven, Bloomington is the perfect place to call home. 2. You appreciate the arts. Bloomington is home to the flagship campus of Indiana University, and as such, the town is a midwestern hub for education and the arts. From student musicians to art galleries to live theatre performances, Bloomington gives the culturally-minded a plethora of entertainment options. The Bloomington Entertainment and Arts District—known as BEAD—brings together many of the city’s artisans and performers in one easily navigable area representing multiple cultures, providing you with a rich artistic experience. 3. You’re looking for a small-town vibe. Bloomington is about the seventh-largest city in Indiana—just big enough to provide plenty of opportunities for entertainment and employment, but close-knit enough for that Midwestern small town feel. Plus, local businesses like restaurants, bars, galleries, and boutiques abound in Bloomington. In fact, it made Forbes’ list of the Best Small Places for Business and Careers in 2017. If shopping local is important to you, you’ll find everything you need right at home in Bloomington. 4. You’re a beer or wine connoisseur. Love to enjoy a craft beer or a glass of wine at the end of the day? Bloomington is home to local favorite (and 18-state distributor) Oliver Winery, a producer of award-winning wines and ciders. You can tour their facility and visit the tasting room to learn more about the winemaking process. If you’d rather see what’s on tap at the local brewery, you’ll want to stop by the Upland Brewing Co. for a pint. Though they have several restaurants & bars in central and southern Indiana, the production brewery is based in Bloomington. And these are just the tip of the iceberg—you’ll find plenty of small wineries and breweries to choose from in the Bloomington area. 5. You’re practical at heart. Food, drink, art, and recreation are all important, but at the end of the day, most folks base their final moving decisions on more concrete factors: Will I find a job? Can I afford decent housing? Is there a good school for my children? Luckily, Bloomington’s safe, affordable neighborhoods, thriving job market, and variety of public and private schools make it an ideal place to establish your home, build your career, and raise your family. Convinced? For an arts-and-culture hub with small-town flair located in one of the most affordable states in America, you can’t go wrong with Bloomington, Indiana. Trust the Indiana movers of Wheaton World Wide Moving to help you start your new life in Bloomington, Indianapolis, and other appealing locations in the Hoosier State.